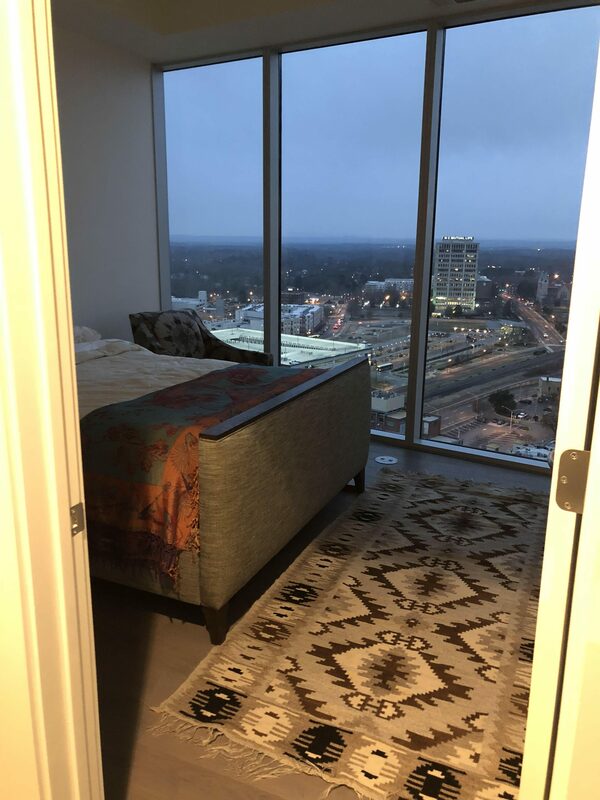 Now that I’ve moved into my tree house on the 21st floor of One City Center I want to share with you my experience of Durham by night. I now have perspective on the city from a wholly new point of view. The title image is of the 21C Museum Hotel. It was originally called the Hill Building and was built from 1935-1937. The architectural team of Shreve, Lamb and Harmon – of Empire State Building fame – designed it. I love having an Art Deco dream outside my bedroom window! 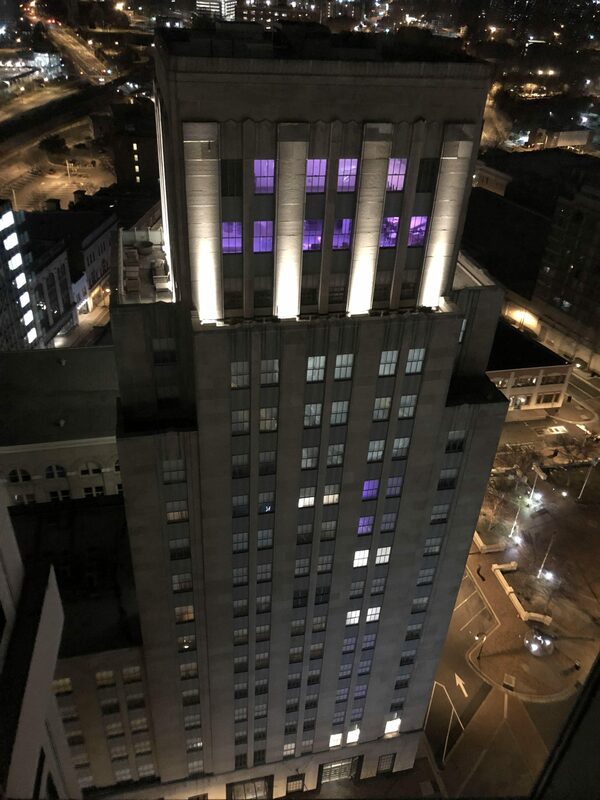 The NC Mutual Life Building is clearly visible. Outside my living room window is a view of the American Tobacco campus. 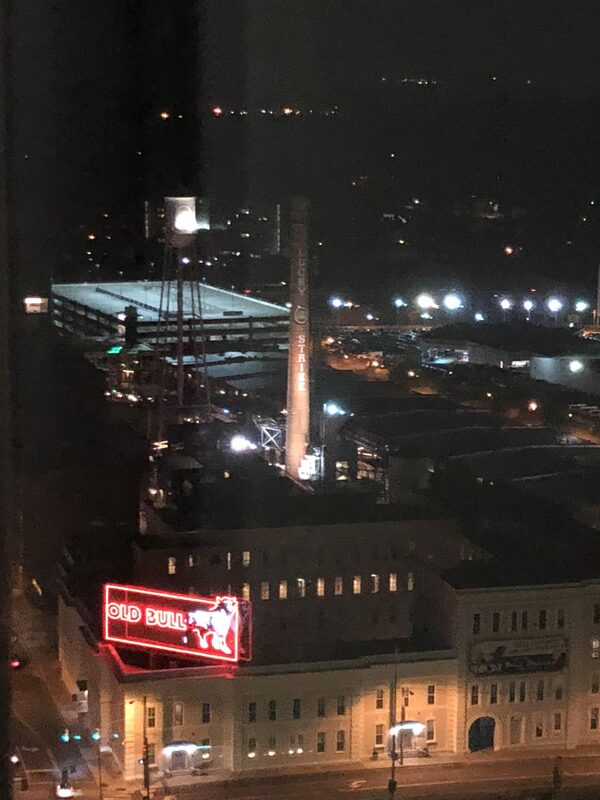 The Lucky Strike smokestack and the Old Bull sign are likely the two most iconic images of the Bull City. 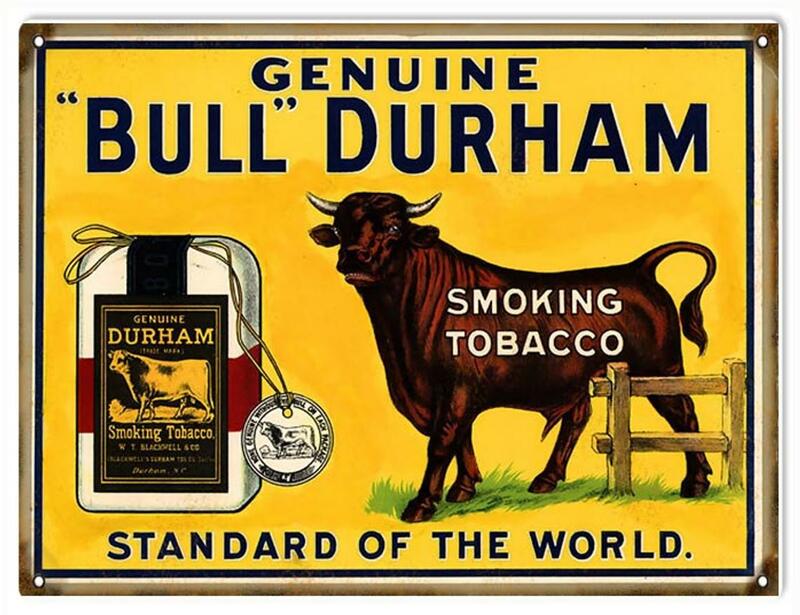 Durham gets its nickname “The Bull City” because of a marketing campaign launched by the makers of Bull Durham Tobacco. The area on baseball fields where relief pitchers warm up is called the bullpen. Some say the origin of the term comes from the Bull Durham posters hung near the area. Here’s a sight. Does anyone recognize it? 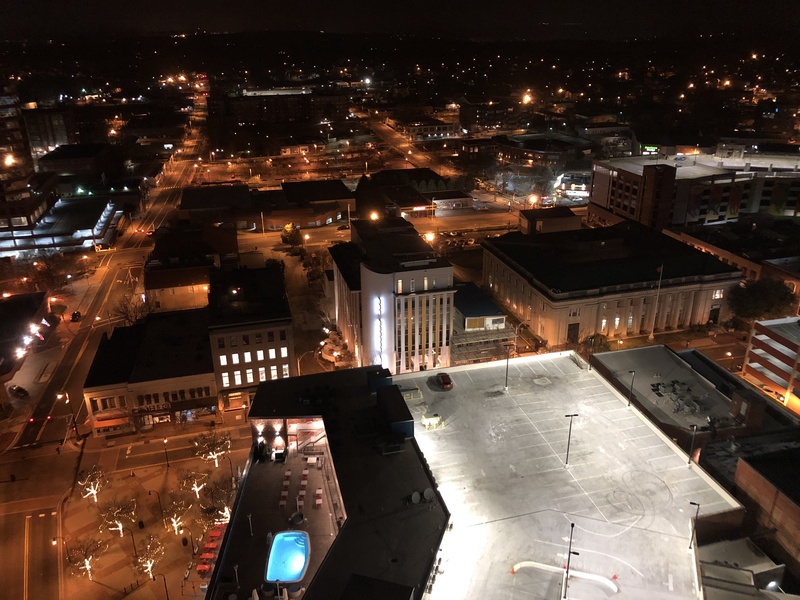 You’re looking at the pool on the fourth floor of Unscripted, a boutique hotel. Okay, its parking lot isn’t the most sightly thing in my purview. However, I can use it to point out two more buildings. The sole red (I think it’s red) car parked on the rooftop lot is in front of the The Durham, a hotel. To the right of The Durham is the Post Office. The sixth floor of One City Center is common space. 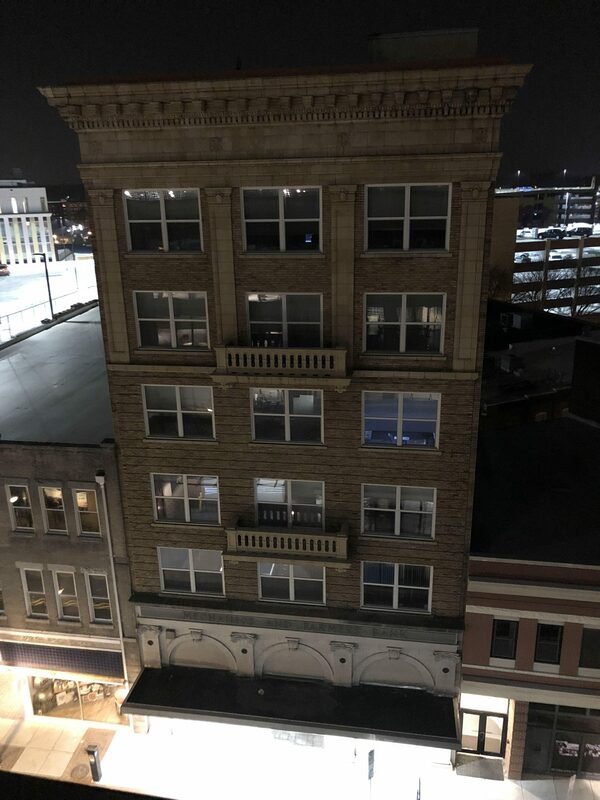 It is the original Mechanics and Farmers Bank Building and dates from 1908. M&F Bank is the largest African-American owned bank in North Carolina and the second largest in the United States. The Neo-Classical Revival style of the building serves as the symbol of Durham’s Black Wall Street. On the outdoor terrace if you walk west, you will see DPAC (Durham Performing Arts Center). 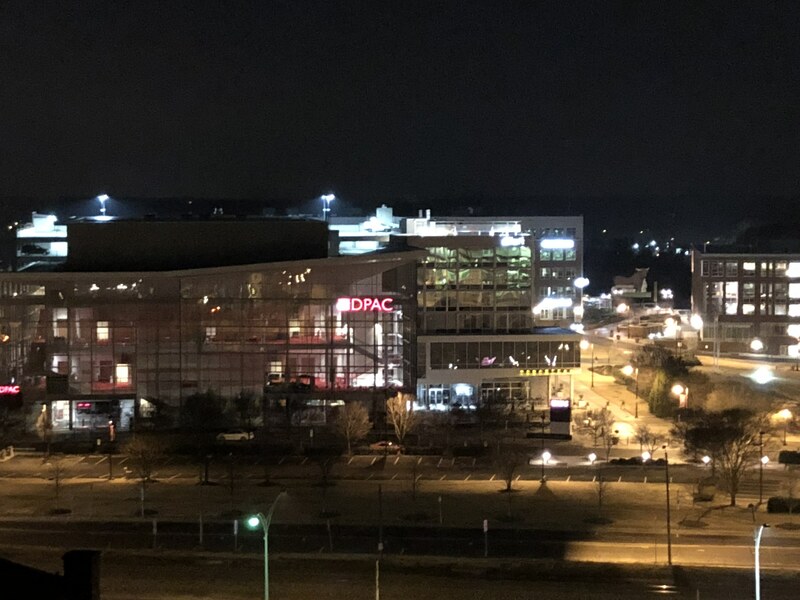 Hidden behind DPAC is the Durham Ball Park. In the picture it looks as if the floodlights are on at the park, although I don’t know why they would be in February. It’s nowhere near baseball season. It’s been very unusual for me and for friends who have come to visit me to experience Durham as a truly urban environment.